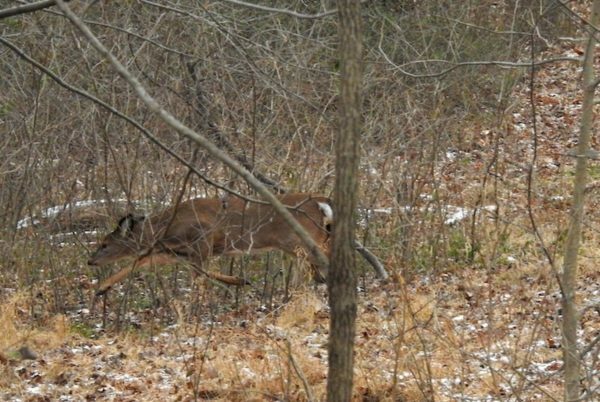 I was walking through the woods today when I heard someone singing a few feet away from me. I turned around to locate the voice. It took a few seconds, but only because I was looking deeper into the trees than I should have. The source of the song was even closer than I expected. 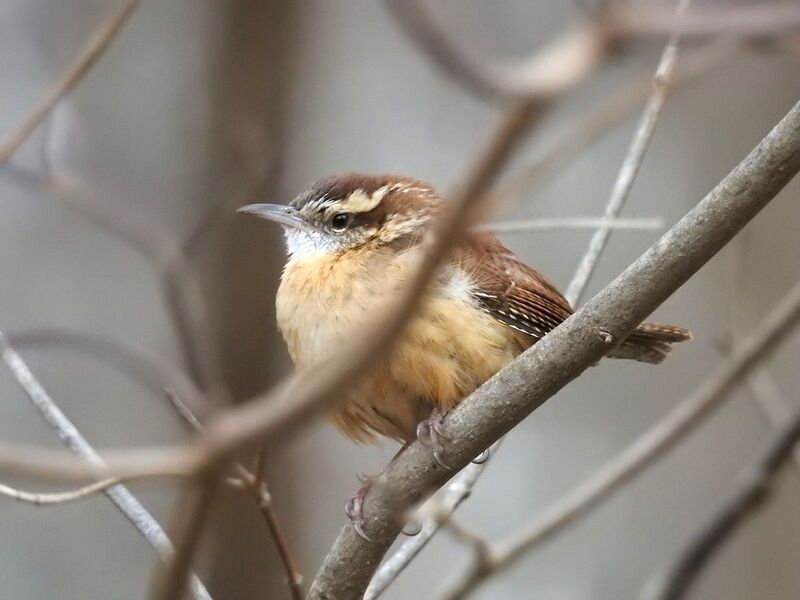 It was a Carolina wren. This was a lovely surprise. I was just complaining yesterday about how the Carolina wrens are difficult to get photos of because they spend so much time in the leaf litter, only hopping out onto the base of a tree trunk long enough for me to point my camera at them before immediately disappearing into the leaf litter once more. It seemed the only place Carolina wrens stay still is on the back of the South Carolina quarter. I wanted to get a better view before leaving Virginia since Carolina wrens don’t live in Wisconsin, but wasn’t sure of my chances with the weather being so cold. It was nice of this bird to grant my wish. In Wisconsin, I see house wrens every once in a while. Like Carolina wrens, they tend to be on the move a lot, making it difficult to get a good photo of one. The house wrens near my abode enjoy diving under the hostas whenever I get my camera out. 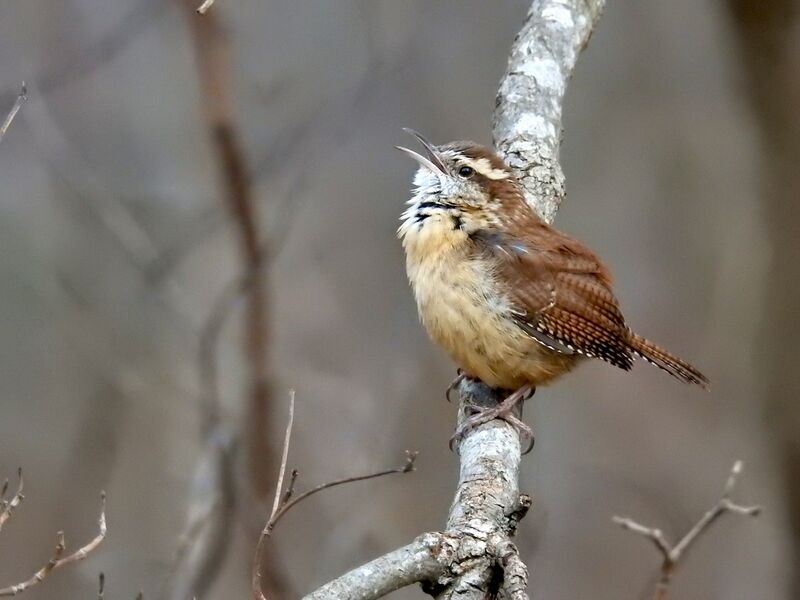 Most wren species originate in the Americas, though the Old World has one species of its own: the Eurasian wren, which is simply known as a “wren” in the United Kingdom. >>Learn more about birds in my birding posts. While taking photos of this accommodating wren, I heard a large group of joggers running through the woods. I got a snapshot of one. So not exactly joggers, after all, although I suppose they were trotting. It was a bit warmer this afternoon than it’s been, making the afternoon a popular one for runners of all sorts. 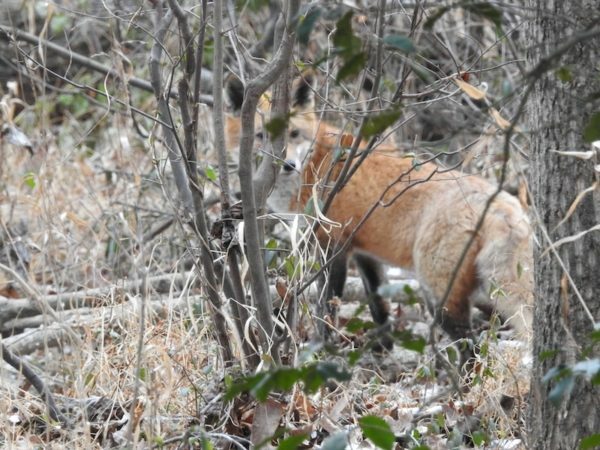 The fox above was chasing another fox through the woods. I have no idea. I’m not a fox behavioralist, and neither creature stopped to answer my questions. They didn’t even stop long enough for me to focus the camera. 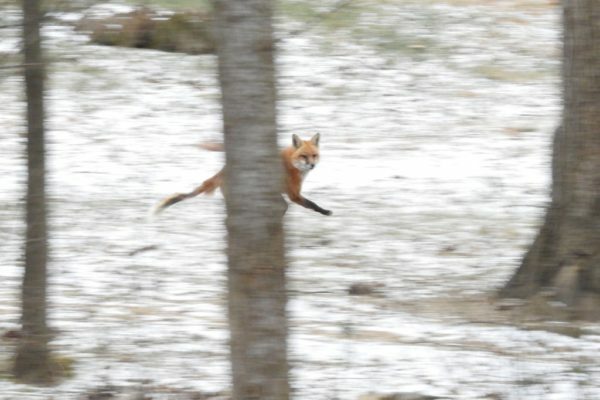 Actually, the fox in this last photo may or may not be one of the running foxes. It has similar coloring to the one that was being chased, but I saw it on a different point in my walk—almost half an hour earlier. It was near the same creek where I saw a fox last week. This particular red fox saw me long before I saw it. I could tell by the look in its eyes and by its posture—it was sitting very still, making itself almost invisible against a tree trunk. Once I looked at it, it stood up and began to move away. It made sure to sneak out between twigs and branches so I wouldn’t be able to focus my camera on it. >> Read more posts about red foxes. Thanks so much! It sure is easier taking action shots now that I've gotten rid of that filter :) But there was also a lot of luck involved too.